Emergency hand pump flashlight. 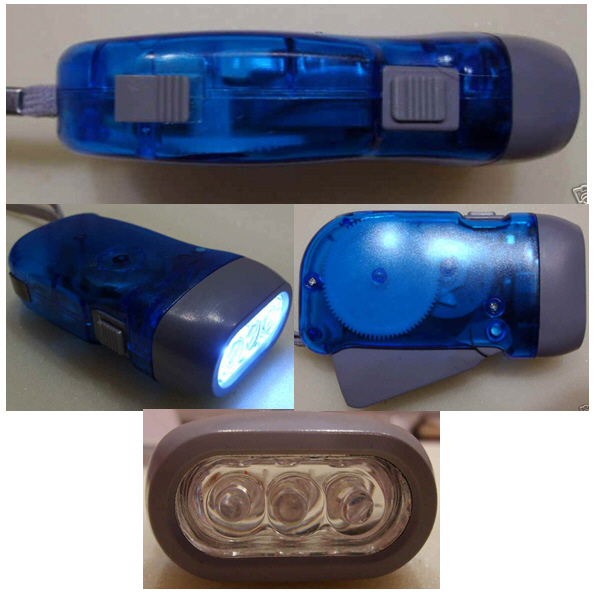 Super bright 3 LED system which lasts a long time. Don't over pay for this product - work with a USA company that will ship worldwide. Green technology - never needs batteries which ultimately end up in landfills. Pump a few times and have good, usable light for hours. Certified CE safety compliancy and lead free Ergonomic design and strap for easy use, portable Hand grip locks into flashlight when not being used. Super bright white light. Ideal for anywhere you need a dependable flashlight without worry about batteries. Cars, campers, motorcycles, survival shelters, backpack, around the house.